I absolutely adored the first book in this series, A Darker Shade of Magic, so I knew I just had to pick this book up. And, I wasn’t disappointed. This is such a fantastic installment in the series – and I loved getting to spend more time with Kell, Lila, and Rhy. 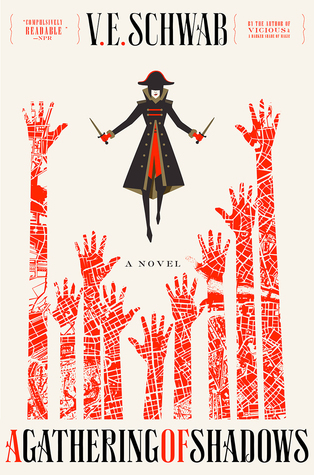 A Gathering of Shadows picks up about 4 months since the end of the first book. Kell has given up his smuggling habit after returning the obsidian stone to Black London. But, both he and Rhy are still struggling with finding their lives magically linked. Rhy is conflicted. He’s happy to be alive, but hates that he had no say in the matter. And, Kell finds himself full of restless energy, and is feeling more like a prisoner than ever. Lila has sailed away to fulfill her dreams of being a pirate, but that doesn’t stop Kell from looking for her in everyone he sees. Red London is making preparations for the Essen Tach, a magical competition that pits 12 magicians from 3 kingdoms against each other which brings some old friends and familiar faces back home. White London is slowly mending itself, but some of the darkness of Black London is creeping in and threatens to bleed over into Red London as well and destroy the delicate balance of magic. This book builds on everything I loved about the first book. There is plenty of action, banter, and just enough romance to keep me interested. The relationship between Kell and his brother is tested, but steadfast. Delilah Bard continues to be a total badass. Plus, we get introduced to a new character and romance that I’m totally here for. There is so much to love about this book/series. I thought parts of this were a bit slower than the first book, but I really enjoyed all the additional information we got about the world/characters. I felt the magic system was much more fleshed out in this installment, and I thought the magical tournament was a really smart way to propel the story forward. It allows for both a short-term “problem” and a long-term one to keep you interested in what’s going to happen next. Of course, there were also plenty of swoon-worthy moments to keep my shipper-heart happy. “Kell has only two faces. The one he wears for the world at large, and the one he wears for those he loves.” He sipped his wine. If you liked A Darker Shade of Magic, you’re going to like this. Schwab’s writing is consistent, the characters are their same lovable selves, and the ending will make you want to immediately jump into A Conjuring of Light. And, if you haven’t read ADSOM yet, what the heck are you waiting for? Nice review! 🙂 I really need to read something by this author! I always hear such good things. And, you absolutely should! I’ve enjoyed the first two books in the series so much, that she’s likely going to become an auto-buy author for me! I loved the introduction of Alucard and everything he brought to the story and the different character dynamics! The only thing that bugged me a bit was the fact that this book was much slower than the first one. I definitely agree with you on the pacing – there were places where it dragged. Alucard was such great character! I wasn’t expecting to like him nearly as much as I did. I love the banter between him and Lila. And, of course I ship him with a certain someone – big time. I think I was pretty much set on liking Alucard pretty early on and YES, him and that character! I was swooning so hard! And it only continues with the next book. But also him and Kell. I was laughing out loud a few times! I know, right! I didn’t think I could ship anybody more that I ship Lila and Kell. Then here comes Alucard swaggering in – and totally ruined that. Haha. I’m almost half way done with Book 3 and absolutely loving it! And, you’re right. The banter between Kell ad Alucard is pretty hilarious! I’m hoping to finish A Conjuring of Light tonight! I’m so excited/nervous about it. I just want them all to be happy! The ending is sad but sweet at the same time 🙂 I think you’ll like it!